Partner John Painter and Managing Partner Tim Pearce. Worcester-based CB Chartered Accountants has merged with Haines Watts as part of the national accountancy firm’s ongoing expansion plans. 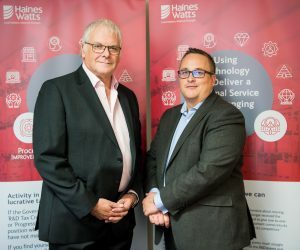 The deal will see Haines Watts welcome a new partner, CB Chartered Accountants founder and Managing Partner John Painter, and his team of ten. Chris Hobbs, CB’s former Tax Partner, will take on the role of Tax Consultant. CB’s offices in Worcester and Tewkesbury will be rebranded with the office in Tewkesbury becoming Haines Watts’ first permanent base in Gloucestershire. Tim Pearce, Managing Partner of Haines Watts Worcester, said: “We’re delighted to be joining forces with John and his team. A top 15 accountancy firm, Haines Watts prides itself on supporting business owners by providing hands on accountancy, taxation and business advice. It works alongside a range of businesses across many sectors including healthcare, leisure and manufacturing and, like CB, specialises in working with family-owned businesses. As a result of the deal, Haines Watts Senior Manager James Howard and his CB counterpart Dan Jackson have been promoted to Associates while Client Manager Gareth Williams has been promoted to Cloud and Outsourcing Manager and Zoe Jones to Practice Manager. The press release has appeared in the Worcester News and Business & Innovation Magazine and on the Midlands Business Insider, The Business Desk West Midlands and Herefordshire and Worcestershire Chamber of Commerce websites.